Are you looking for a perfect bicycle for your son? Brand new Muddyfox Cyclone 20 Boys Dual Suspension Bike will be the perfect choice for you. It is a full suspension bike which is a perfect fit for riding in terrains with obstacles. It is specifically designed to provide a great cycling experience to all its riders. Muddyfox Cyclone 20 Boys Dual Suspension Bike has a 13-inch dual suspension rigid frame made of steel. Its frame has shock-absorbing suspensions in both the front fork and in the rear frame. This allows it to absorb shock impact not only from the front of the bike but also from the rear. Thus, it is more suitable for riding on rugged terrains with obstacles. In addition, Muddyfox Cyclone 20 Boys Bike has dual V-brakes or Brake Leavers and a two finger adjustable V-brake compatible with resin. This gives the rider more freedom and flexibility when cycling through more steeper and technical trails. The rider can apply brakes on either side if he needs to stop. This bike has a 6 speed Shimano twist grip gear system which makes it easy to change speed. It has ATB 520mm light steel handlebars that provide easy control and good positioning. Its Bottom Bracet system has a Cr-mo axle and 5 ATB pieces. As a result, Muddyfox Cyclone 20 Boys bicycle performs well in off-jumps and downhill riding. This bike possesses 20-inch tires with 1.95 treads providing an easy and stable ride on the road. The tyre tubes contain Schrader valves that are very strong and long lasting. Thus, the rider can cycle on even heavily rugged terrains without facing many difficulties at all. The wheels will not easily get pierced unless by something really sharp or pointed. This bike approximately weighs about 14kg and is a little bit heavier than the other competitive models available. However, a boy will not find it difficult to manipulate at all. Its heaviness makes it ideal for riding on uneven grounds and surfaces. This bicycle comes with 23-28″ leg sizes. If the legs of the child are long enough to reach the paddle of the bicycle, he can use it without facing any problem. Furthermore, this bike has a double plastic chain guard covering the KMC steel chain. This chain guard prevents the occurrence of any type of injury that could happen when the child’s legs come in contact with the chain. There is a comfortable vinyl weather resistant saddle mounted on the top of the double plastic chain guard. It also has suspension forks that can absorb any kind of shock. This bicycle provides better support to the riders who have back injuries. It is really comfortable to sit on its saddle. As a result, a rider can ride with so much ease even in much steeper and challenging geometries. 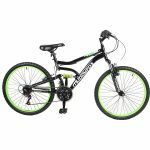 The Muddyfox Cyclone 20 Boys Dual Suspension Bike is very popular among both parents and children alike. It comes in very attractive green and black models. It is suitable for a young boy between 8-11 years. However, even an older child or young adult can use it, if his leg size matches with that of the bicycle range. Usually, buyers are very happy with their purchases as it can be put together quite easily. A very strong build and it can be used for a long time. It is very comfortable to ride and it is an ideal choice for riders with back injuries. provides an excellent cycling experience to its users. Can my child ride this bike? 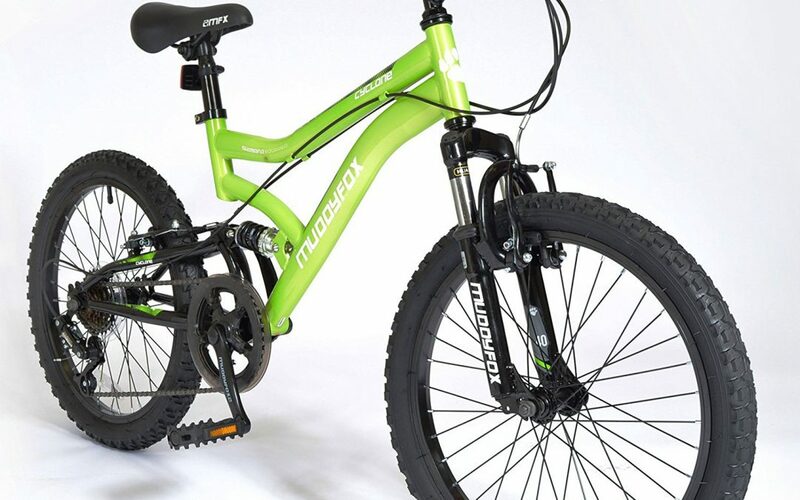 This bicycle is specially designed for boys of 8-11 age range with 23-28″ leg sizes. If your child can easily reach the paddle from sitting on the saddle, this bicycle will definitely suit him. You might also have to consider the fact that this bike is a bit heavy with a weight of 14kg. Therefore, your son should have the ability to control the bike without facing many difficulties. Is the Muddyfox Cyclone 20 Boys Bike reliable? Muddyfox Cyclone 20 Boys Bike is one of the safest bikes on the market. It has a dual suspension system that can absorb shocks. As a result, it is very safe to use it even on quite challenging grounds. It also has a very reliable brake system and a handlebar that can ensure easy navigation and control. Furthermore, it has a unique back support system that can prevent any back injuries. What to do if assembling parts are missing in the package? Usually, 85% of this bike is already assembled when it comes to your door step. You only need to do some little work when putting it together. If accidentally some parts are missing in your package, they will definitely provide them without any delay. Although you have very little assembling to do, make sure that you have done each part right to avoid any possible injuries. Muddyfox Cyclone 20 is a model that suits boys very well. Dual suspension technology that can provide you a smoother ride. Good back support for riders with back injuries.